Our AVR Linear Capper is designed for fast repeatable changeover and maximum ergonomics. Our key market advantage is that we design the machine so that as few format parts are needed as possible. We reduce changeover time and increase operating efficiency! Our linear rake Capping Machine can have up to 4 capping stations. Dip tubes, push on caps and screw caps and various other closures can be used on our machine. The linear capper is mechanically driven with an under-frame integrated control cabinet. The bottles are fed in a single lane to the machine where a bottle divider automatically separates them to the required distance. The divider unit will not need any changeover part as the process is done via the HMI. Sorting and feeding devices feed the caps to the capping heads where the caps are applied onto the bottle orifices. These capping heads can be torque controlled using either servo or clutches. Our sorting and feeding devices can be designed to be able to run different sizes of caps on the machine without having to change over. An induction sealing unit can also be integrated to the machine which is normally placed between a capping and re-torqueing station. The height adjustment of the capping and retorquing stations is automatically controlled by the recipe integrated into the HMI. Nitrogen purge station can be fitted to flush both container and the underside of the cap before closing. The whole machine can be enclosed and nitrogen purged. 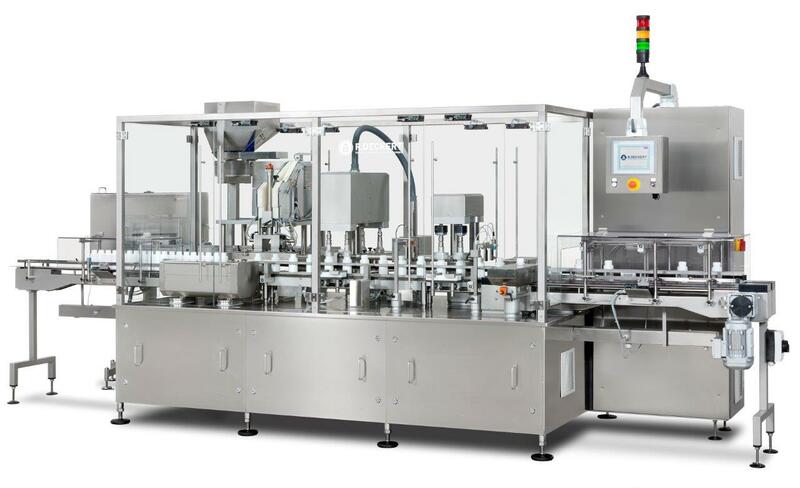 The FVR Monoblock liquid filling machine combines filling, screwing, capping and weighing into one machine capable of 100 containers per minute. The modular monoblock design packs these features into around 8m of length. The customer, a cosmetics manufacturer with a focus on natural products, already had Deckert machines of previous generations to the FVR Monoblock liquid filling machine. Unlike its predecessors, the FVR combined multiple closing stations, check weighers and filling pumps into a single modular machine. This reduced the space and change parts required. [caption id="attachment_1198" align="aligncenter" width="840"] Cosmetics Liquid Filling Closing Machine FVR[/caption] Designed to meet the customers specific requirements the machine was built with capping stations to handle roll on deodorants, over-caps as well as pump spray heads with dip tubes. 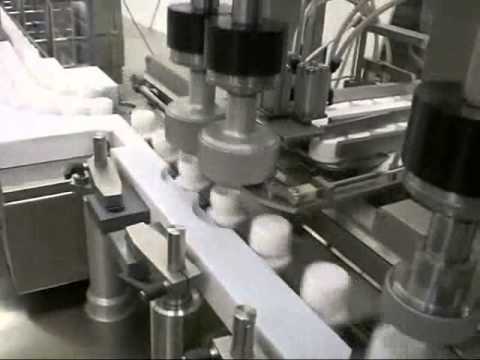 Many products that run on the machine require a combination of closures to be applied on the machine, e.g roll on balls as well as screw caps or lotion spray closures as well as over-caps. Servo controlled cam movements for filling and closing that can be edited from the HMI and saved in the recipe. High level monitoring and reporting. The AVR cappers new improvements minimise change parts, cutting out cost and reducing changeover times. Even more changeover functions are now controlled the control panel.